We revisited Kichijoji and queued for 15 minutes (short queue) to buy the famous ‘mitsu katsu’ (fried meat balls) and croquette. Then we bought some canned cafe latte from a machine and ate cakes at the Inokashira Park. Later, in the park we also had some sushi and chirashi we bought from near the station with some sake. Life in Tokyo is good. 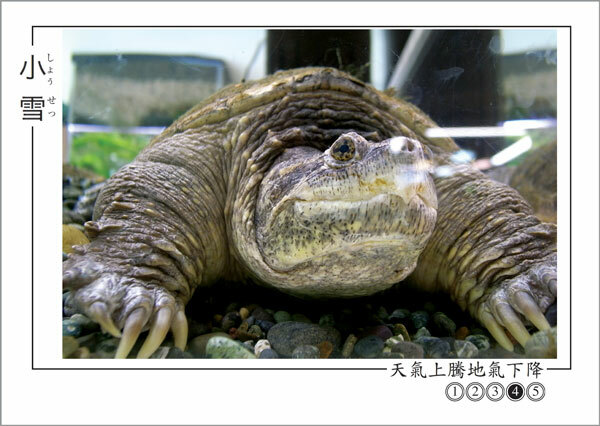 The purpose of the trip was to visit the aquarium in the Inokashira Shisen Bunka Park (nature park). There we were brought back to our interest in the waterways of Tokyo. The simple arrangement of the aquarium was thoughtful and engaging. The focus is on local rivers and half of the tanks were devoted to the Kandagawa and its source, the Inokashira pond. The exhibits were ecosystem-based and are divided into the water source, upstream, mid-stream, and downstream environments. There is even one tank that is set up as a non-specific koen (park) pond to demonstrate the problems that come with previous urbanization of waterways. It has no plants, a few fish, a giant snap turtle, and some empty drink bottles (these were obviously genuine articles fished out of some nearby pond). Our fellow visitors consisted of retirees, university students, parents and small children. The university students, in particuar, were very impressed by the wildlife and SLR cameras were snapping at the exotic exhibit. Near the giant frog area, I heard a jovial old man said, ‘Taberu (to eat)’. I hope he was just trying to frighten the enthuastic youngsters.